The No. 12 Texas A&M Aggies and the No. 19 Auburn Tigers face off in a key SEC series as the league ledger hits the midway point. COLLEGE STATION, Texas — The No. 12 Texas A&M Aggies and the No. 19 Auburn Tigers face off in a key SEC series as the league ledger hits the midway point. After four weeks of conference action, the Aggies (7-4-1 SEC) and Tigers (7-5) are two of seven teams within two games of first-place Georgia (9-3) in the standings. The Aggies’ Asa Lacy (79) and John Doxakis (57) rank as the No. 2 strikeout combination in the nation through eight weeks of play. Entering the weekend, the pair have combined for 136 strikeouts, trailing only Mississippi State’s Ethan Small (79) and J.T. Ginn (60) who have racked up 139 punchouts. Texas A&M’s one-two combo is one of just six in the nation to have combined for 120 or more strikeouts heading into Friday’s action. 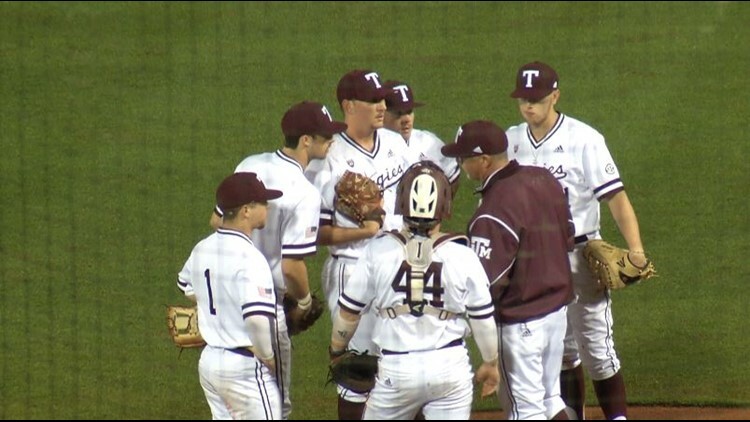 The Maroon & White rank in the top 20 in the nation in numerous pitching categories, including strikeouts per nine innings (2nd - 11.3), K-to-BB ratio (3rd - 3.85), WHIP (8th - 1.14), ERA (9th - 2.90), walks allowed per nine innings (11th - 2.92), hits allowed per nine innings (15th - 7.30) and shutouts (16th - 4). Individually, Lacy ranks fourth in the nation in strikeouts and strikeouts per nine innings (14.61) and 10th in hits allowed per nine innings (4.25) and 16th in ERA (1.29) and 29th in WHIP (0.88). Doxakis ranks 7th in the nation in K-to-BB ratio (11.40) and 12th in walks allowed per nine innings (0.93). Kasey Kalich ranks 8th in the nation in saves with eight. In the weekend series at LSU, Braden Shewmake moved into ninth place on the Aggies’ career RBI list. With 146 career ribbies, he needs one to tie Chuck Knoblauch for eighth place. Shewmake also moved into a tie for 10th place on Texas A&M’s career triples list with 10. Texas A&M and Auburn are both licking their wounds from dropping SEC series last weekend, along with losing in midweek action. The Maroon & White lost two of three at LSU and dropped a midweek game against Texas State (5-3). Auburn lost two of three in a home series against Arkansas and lost an 11-6 decision to Jacksonville State Tuesday. Every game of the series is available for viewing on SEC Network +. SEC Network + provides digital-only events to SEC Network subscribers through WatchESPN and the ESPN app on smartphones, computers, tablets and connected devices (Amazon Fire TV and Fire TV Stick, Apple TV, Chromecast, Roku, Xbox 360 and Xbox One). All three games will air on the radio locally. All three games are broadcast in the Brazos Valley on SportsRadio 1150 and/or 93.7 The Zone with Dave South on the call.